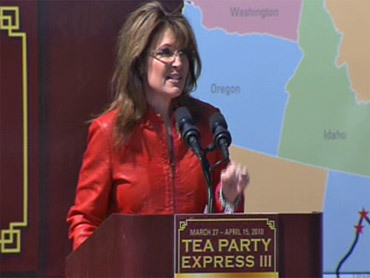 Sarah Palin: Obama's Policies Are "Un-American"
Sarah Palin spoke at a "Tea Party Express" rally on Boston Common today, where she said that the policies being put forth by President Obama and other Democrats had "un-American" consequences. Palin noted that she was not calling Democrats specifically un-American, but that the results of the their efforts -- which she said entailed "stealing" from "our kids and our grandkids" -- could be characterized that way. "I'm not calling anyone un-American, but the unintended consequences of these actions, the results, are un-American," she said. Reading from prepared remarks, Palin said Democrats' policies make Americans "less secure" and "less safe," as well as "more beholden to foreign countries." She complained that Americans spend 100 days of the year working for the government, telling an enthusiastic crowd, "Government should be working for us -- we should not have to work for the government." Palin characterized spending as out of control and suggested the current administration had raised taxes, despite the fact that the majority of Americans have gotten a tax cut under Mr. Obama. "They just don't get it. They think we can borrow and tax more and spend more and get us out of this problem," she said, deeming the administration's policies "insane." Palin said she did not blame Americans for not knowing what was coming because "we had a complicit media that did not do its job completely" and failed to adequately vet the candidates. She thanked the Tea Party Express group for "putting up with all the B.S. from the lamestream media," among them claims that some Tea Partiers have been racist and violent. The Tea Party Express, as Politico reported today, is not exactly a grassroots organization: It was the brainchild of a Republican political consultant in Sacramento seeking to "give a boost to our PAC and position us as a growing-force/leading-force as the 2010 elections come into focus." Palin criticized the health care reform package as "the mother of all unfunded mandates" and attacked the administration's energy policy, again calling on America to "drill, baby, drill." "You want to see us keep bowing to the Saudis and coddling Chavez?," she asked. She said most of her friends and family, including her husband Todd, are independents, like many in the movement. "We have an expectation that every able bodied American will work, and will be rewarded for their work ethic," she said of those gathered for the protest. Palin said it was a "perfect time to come together in beantown" because it was a day before the deadline for filing taxes, adding "Boston, if anyone knows how to throw a Tea Party, it is you." She hailed Massachusetts for electing Republican Sen. Scott Brown in January to the seat previously held by Sen. Ted Kennedy, saying the state "shook up the United States Senate." Brown and many Massachusetts Republicans elected to skip the rally. Some expressed concerns about the fringe elements that might be attracted to the event. Palin does not disclose how much she is paid for speeches. She reportedly earns to $100,000 to give an address, though she does not charge for every event. On Tuesday, California's attorney general launched an investigation into a state university foundation after students recovered her contract for a speech at the California State University form a trash can. It mandated Palin be flown first class to the speech (or be provided a private plane) and given a suite or two single rooms at a deluxe hotel. It also stated that her compensation for the speech should not be revealed. Palin's earnings over the last nine months are estimated to be at least $12 million.